My question is this- Orchestras have some of the best trained and skilled musicians around. Why do they primarily confine themselves to a certain genre and periods of music? Why aren’t they playing all the best music out there? I know most groups have a pops series, but that still barely scratches the surface of the available material and it is separate from their main product. And really, why are the pops separate? This is my thought- Have an evening of music around some theme like romance. One of the pieces is Led Zeppelin’s “Heartbreaker” (or some other selection, I am just trying to stay away from the obvious “Stairway to Heaven”), maybe there is another contemporary rock/pop/blues/jass piece as well and interspersed between them are pieces of the regular repertory (or vice versa.) I am not suggesting getting rid of the current programming, just enhancing it with other works. The concept of great music being part of a continuum of excellence that didn’t stop at a certain year. The only compelling reason I can think for not doing this is artistic unity of an evening. But I wonder, does it really matter to audiences? If you do the beginning of Hamlet set during 1920s flapper days and then shift to steampunk, audiences will find it jarring and perplexing. Would there be the same problem going from orchestrated classic rock to a baroque piece of a similar energy in the same evening? Since many potential pieces weren’t written for orchestras, I imagine there would be some cost involved in arranging songs for a larger number of instruments. That could certainly prove an impediment for some organizations, as might royalty payments where required. It might prove a boon for lesser known ensembles if one group’s arrangement was recognized as superior to another’s. Given that the music may be more widely known, a larger segment of the population would have the discernment to make that judgment. I know that not every piece will lend itself to adaptation for orchestra performance. Those who do not recognize that may shout “Play Freebird!” or the equivalent. But I have to believe there is potential in a lot of works. I guess there would also be a concern that things were being dumbed down or compromised to fill seats. I have heard of symphonies playing video game themes and integrating cell phone rings into the performance. There is much more potential for a quality experience in this idea –and an interesting educational one too boot! You can have a blues guitarist perform Lead Belly’s version of “Gallis Pole” and talk about the centuries old history of the folk song and then have the whole orchestra play Led Zeppelin’s “Gallows Pole” as a comparison. Talks about the composers might be a lot more interesting to audiences because some have lived recently enough that the circumstances that influenced their writing are more familiar to audiences. Then there are the controversies over song writing credits. I know that it is easy for people on the outside to criticize and say they could do better. What I have described here has sort of been my idea of how I would program things if I were in charge. But to a degree, I am. I have a lot of under employed symphony musicians running around my community right now. What is to keep me from going to them and asking them to put together a program that mixes a few of the standard pieces with arrangements of more contemporary works for a performance some point in the future? Given my financial resources, I wouldn’t imagine I would get the whole orchestra, but 1/4 might sound impressive enough to determine if the basic concept is sound. Any success I may have wouldn’t necessarily imply similar promise for orchestras. I do not run an orchestra so expectations of my events are much different than for theirs. While I would love to have this idea succeed and an orchestra schedule these events at my space, real success in my mind is when a change like this becomes the primary practice, not separate from it. I have been writing Butts in the Seats (BitS) on topics of arts and cultural administration since 2004 (yikes!). Given the ever evolving concerns facing the sector, I have yet to exhaust the available subject matter. In addition to BitS, I am a founding contributor to the ArtsHacker (artshacker.com) website where I focus on topics related to boards, law, governance, policy and practice. I am currently the Director of the Grand Opera House in Macon, GA. Among the things I am most proud are having produced an opera in the Hawaiian language and a dance drama about Hawaii's snow goddess Poli'ahu while working as a Theater Manager in Hawaii. Though there are many more highlights than there is space here to list. 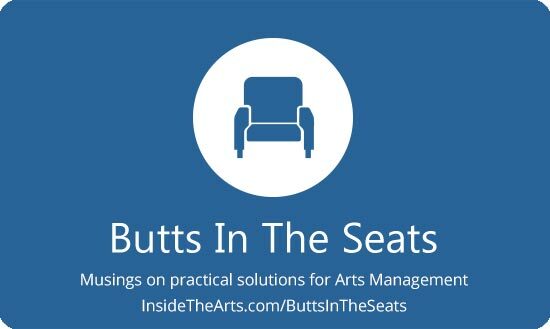 Enter your email address to subscribe to Butts In The Seats and receive notifications of new posts by email. Just Leave Those Barriers Intact, Eh? I think you’ve answered your own question. The very nature of intensive orchestral instrumental training is that it tends to crush versatility. An orchestral player might be a highly skilled musician with good ears – in theory able to play anything, and some of course do – but the training is so focused on one range of genres and styles that it’s hard for many orchestral musicians to participate in other styles. Or rather, it’s hard to participate at the level of performance that you expect in your classical life. For example, I have a friend who plays in an orchestra and has recently begun to take a serious interest in jazz. He’s a fine professional musician, but when it comes to jazz he practically feels like a beginner. And no accomplished musician feels comfortable playing music badly, so they’re likely to avoid the styles that they don’t “own”. Thanks for your response. A couple thoughts–plenty of orchestra musicians end up playing on rock albums and backing up Pancho Sanchez and Diana Krall when they come to town. Even if their skill isn’t as great in these instances as it is while playing Bach, it is still of high quality. But going back to your point about training. If orchestras were playing a wider selection, musicians would be trained to play a wider variety. At the moment, they are being trained to play what is valued and that can be changed. I have heard a number of stories of musicians who would play with an orchestra, walk down the street and then jam in a jazz or blues club all night long. Perhaps these are talented outliers, but I suspect that isn’t entirely the case. Don’t underestimate: these costs can be huge, especially when compared to the costs of presenting concerts of standard orchestral repertoire, even those including contemporary compositions. Good arrangements can be expensive, for some programs approaching what you’d pay for a commission of an original work. Similarly royalty payments are inevitably required and they really mount up, especially if you want to do anything really well-known and popular. So even when such a program is an artistic and audience success, royalties and arrangements can make it a financial liability. No wonder Beethoven seems attractive! Being a classical musician, I guess I resemble the remark of not being as versatile as say a jazz musician. However, there are other reasons why orchestras may not incorporate different genres into one concert. I do agree that the costs for arranging and royalties can also be a factor. Orchestras already have one of the biggest budgets in the arts industry. They need to raise a huge amount of money each year to simply have a concert schedule. Adding to the budget, especially right now, may not be a good idea. I have done surveys of orchestra audiences and the existing audiences do not support the other genres as much as we hoped they would. There is a smaller percentage that seem to enjoy the other genres and a small percentage that actually want to experience “new” music. Having a concert that incorporates Led Zeppelin on the program may alienate the major portion of your audience. Of course surveys are subject to the demographics of your specific orchestra’s audience and will tend to differ from symphony to symphony. On the flip side, the small percentage that enjoys the pop concerts, do not tend to enjoy the classical concerts as much. However, having special concerts once in a while is a good thing. Beatles, Led Zeppelin, and similar programs do sell out and they tend to bridge the gaps between the two audiences. You can use these concerts to establish relationships with this new up and coming audience segment. There is hope that they will attend the classical concerts with additional efforts. There is also hope that the general classical music audience that also attends these concerts will enjoy more of this type of programming in the future. Once you formulate this new hybrid audience, then maybe your suggestion would be financially feasible for orchestras. The Beatles may bring your classical audience to the pops concert, but do they bring the pops audience to the classical? If not, there really isn’t a lot of gap bridging happening. There may be an alienation factor for the existing audience, but it sounds like the classical audience has a level of tolerance for the pops already. Your real challenge is getting the pops audience to say I came for the Beatles, but you know, there is something to that Bach. Actually, a few orchestras have attempted Bach to the Beatles programming. I think many of these concerts to alright, but not sure they are attracting the pops audience still. So, your assessment of my comment was correct. It is a challenge to get the Movie Music and Broadway attendees to go see a mostly classical concert. The only chance we have is using the popular classics on a pops concert and not the other way around. Maybe they will call it “cartoon music” and later learn that is really classical music in disguise. Oh, there is so much to talk about. . .
Having a symphony orchestra play Led Zeppelin would be interesting, but it wouldn’t make people think, “This is better than the original.” If we had to read a Danielle Steele re-write of Pride and Prejudice, are there many who would prefer that to Austen’s work? There’s so much good and interesting music written _for orchestra_, both old and new, that never gets played, why would I want to hear second-hand Zep? On the converse, I have a limited tolerance for ELP’s Fanfare for the Common Man, or Yes’s remake of Brahms 4. As far as the educational experience – why don’t you play Leadbelly, and then have a LZ cover band play Gallows Pole? Why do you need an orchestra for that at all? Why is it incumbent upon the orchestra to educate, but not the rock band? To most Americans, growing up in postwar Britain (like Page and Plant) is as foreign an experience as 19th-century Vienna. I object to your characterization of what constitutes “the best music out there” with the implication that it must be pop/blues music. Orchestral musicians play non-classical music because they have to to pay the bills, not because they want to. If the CSO or the NY Phil desperately wanted to play more pops, they would have it written into the contract. Audiences for both Classical and Pops are shrinking, with Pops shrinking faster because that audience, who grew up with the Tin Pan Alley and Big Band music which constitutes most Pops programming, is dying more quickly. Talking about crossover between current Classical and Pops audiences is re-arranging the deck chairs on the Titanic. Sure, you could assemble a group of musicians to play whatever you wanted, but could you sustain that over 3-8 concerts a year, year after year? I mean, outside the 2 or 3 metro areas where there’s a critical mass of an audience from which to draw? [OK, calm down, dude.] IMHO the issue is not whether you could do this kind of thing as a stunt (which is what things like Video Games Live are), but whether it is sustainable over the long-term. I’m not saying that I could do it better, but I would hate to see something like this fail, to give non-attenders another reason to say, “See, NO ONE likes classical music.” Orchestral music should succeed or fail on its own terms. If they can’t get an audience to hear Bach, or Brahms, or Berio or Birtwistle, then the orchestra should go the way of the broken consort. Yes, I sound like a reactionary, and maybe I am. I love classical music AND pop music. But classical masquerading as pop, or pop masquerading as classical strikes me as cheesy every time. Entertaining, yes, but not moving; true examples of kitsch. Wow, thanks for taking the time to make a lengthy comment. I just wanted to note I wasn’t suggesting a cover band follow up on a blue musician playing Gallows Pole, that would be the full sound of the orchestra. And only if they can figure out a way to make it sound decent, of course. I have focused in on blues and blues influenced pop because it requires a bit more skill of a musician than other sorts of pop. Most rock bands aren’t non-profits with educational missions so there isn’t an expectation they provide that service. I have never heard of for-profit orchestras providing educational services either. I’m thinking Broadway shows and movie studio orchestras, both of which are less common. Oops, something I meant to ask in my last response– do the CSO or NY Phil musicians actually have enough influence to ask for more pops? From what I have read over the years, it doesn’t seem like the musicians have that sort of impact on a macro level. Perhaps those particular ensembles do given their prominence, but it do orchestras by and large? This is certainly true. However it exposes the (perhaps fatal) flaw in most orchestra administrators’ thinking. You’re asking the wrong people. If the point is to attract new audiences, perhaps orchestras should be asking people who don’t ordinarily go to the symphony. Mike – I think the point of the conversation was to find a way that both the classical music audience and the pops audience could enjoy more than their own preferences using concerts such as the Beatles and Led Zepplin to create a sort of hybrid audience of the two. It’s getting both audiences to branch out of their comfort zones to discover new and exciting ways to listen to symphonic music. When someone suggests we play popular music I cringe. It’s not because I don’t like it – I do like a variety of music – it’s that we’ve played so many arrangements of popular tunes and they are so inferior to the original. I can’t tell you how many pops concerts I played in the past (they no longer get done in my orchestra) when I’ve walked away embarrassed by the horrendous butchering of something like a great Beatles’ tune. They frequently sound like elevator music. Sigh. So I read this suggestion and it makes me nervous! I’m all for change and trying new things. But whatever is done must be of the absolute highest quality. And I do wonder if someone would want to hear orchestral arrangements of their favorite rock band. Well Patty, I will grant you the elevator music result. I think at the core, my question is why all music performed orchestras perform seem tethered to a certain time period. Even the newer compositions either sound that way or have an abstract quality that is just as perplexing to new audiences. Many Broadway musicals are similar in that there is a common quality to the singing that allows you to identify unfamiliar music as originating from there. When I reference popular music, it is because it is something I know. Given the option, I would always go with something original rather than a cover. So where is the new stuff that has some chance to appeal to today’s audiences? Bring it on! There doesn’t seem to be any. So absent that, if orchestras are going to focus on playing high quality stuff from the past, I going to suggest expanding to quality stuff from other time periods. It sounds as if you are saying that Mozart sounds like Tchaikovsky sounds like Stravinsky sounds like Lou Harrison. I just don’t hear it that way. Maybe what you are saying is that it sounds the same because of the make up of an orchestra? I mean … strings, winds, percussion … it’s what an orchestra is (although of course there are variations). We will have an orchestral sound, no matter what we play. But Ravel surely doesn’t come close to sounding like Bach, and Higdon doesn’t sounds like Chopin. Or am I misunderstanding you? I must be …? No, not trying to say they sound alike. Just that the standard program hasn’t moved much beyond the sound of a certain period. Part of it is characteristic to the instruments but also to the music since fiddles used for bluegrass have a sound distinct from classical. That has as much to do with how it is strung and tuned as technique. Don’t worry, I am not going to suggest orchestras try bluegrass, too. As you note, the collection of instruments in an orchestra produces its own sound which frequently results in anything else sounding like elevator music. But that brings me back again to the question, if not orchestras don’t pursue the great music of all time focus, then what is the music characteristic to the ensemble of orchestra instruments that is supposed to bring me and the rest of the uninitiated in? I am willing to admit the great music of the ages idea is a proxy for starting this discussion absent a better idea. If you know of promising work or idea being developed that will revitalize audiences, point me at it. My background was originally in theatre and I will be the first to agree with you if you cite the number of revivals and movie adaptations on Broadway vs. original works as evidence that theatre needs to dump the retreads. There are plenty of great new works being developed in theatre all the time, but tours and licensing of the Broadway material constitutes the fare of far too many theatres around the country in my mind. I hate to keep using pop examples, but the easiest one that comes to mind is U2. There are people who only like their old stuff. There are people who like the new stuff. There are people who like both. Some years back I was having a conversation with a co-worker about the relative merits of the before and after. My boss at the time who had been in the music business for many years said regardless of how many people liked the old stuff, the group recognized they had to change their style to remain relevant. They probably lost a lot of die hard fans by the move and orchestras are likely to lose long time subscribers if they implement a drastic shift in programming. I won’t insult anyone by suggesting that if U2 realized success, so can the orchestra world. When they made the change, they were still highly regarded and had a strong fan following. Most orchestras are not in that situation. The alternative for all the performing arts is not changing. That is perfectly fine as long as we stop insisting people need us in their lives and acknowledge that we will only appeal to a narrowing niche. I think Joe’s onto something here. I’m a musician in a full time orchestra. Obviously I’m a classical musician, and like most, feel like I can’t really make any other type of music. I’m not saying that’s good or bad. Still, I would love to see my orchestra really try to mine new sources of literature for us and seek new collaborations. I’d love to play more music that more people liked. Music more people would come hear us play. But as some of the comments point out, attempts at this type of thing can feel cheesy and fake. No one wants that. For me, it usually comes down to the arrangements and orchestration. Good orchestrations and arrangements? We know what to do and everything comes together pretty easily. In order to make Joe’s idea work on an ongoing basis, I think an orchestra would have to invest the time and money in getting the material together for us to play. Might even need to try having a resident arranger. “Hasn’t moved much beyond the sound of a certain period.” Are you saying Bach, Haydn, Brahms, Stravinsky, Stockhausen, Carter, and Saariaho sound like…well, tell me more about how those composers’ orchestral works sound alike. Joe, the best reason for orchestras to play orchestral music and rock musicians to play rock music is that they can do what they do best. That’s it, and there’s nothing wrong with it. As far as Bach and the Beatles on the same program, I’m as interested in that as in hearing Beethoven and Ades on the same program (yes, I have heard this combo), which is to say, not very much. I love both composers but they don’t particularly speak to each other. Business guru Tom Peters put this very well in the 1980s: successful organizations stick to the knitting. They do what they do best and don’t diversify for the sake of diversification. Sorry Mr. Patti but I’m not getting your point. (BTW, are you related to Doug Patti?) Asking this question is like asking: “How come ballet dancers don’t tap dance” or “Why doesn’t a Renaissance ensemble play Mahler?” Of course there are may be musicians in a symphony who are extremely versatile and, presumably, they will find outlets for their talents. From time to time there may also be outlets for them within their orchestras — do you know about the “Dogs of Desire” (Albany NY Symphony?) There’s an orchestra I’ve heard of that has its own jazz band – can’t remember which one right now but I know I’m right. Pops are “separate” for the most part because they tend to attract different audiences. @Larry Fried, no, not related to Doug Patti. Ballet dancers might tap, they just don’t do it during most ballets. An orchestra concert has a different format than full length ballets in that there is often a selection of different works from different composers. The process by which said works are chosen is actually a mystery to me too so perhaps a clear explanation of that might also hold the answer to my question. There have been a few occasions when I have attended dance concerts by ballet companies where they did employ techniques other than orthodox ballet in smaller pieces comprising an entire evening. Thanks for the note on the Dogs of Desire. Wish they had some audio clips. I would like to hear what they are playing. The Albany Symphony was actually my first orchestra experience long, long ago so I am glad to see them doing different things. Pops attract different audiences because they are marketed to different audiences. I have been to many events featuring mixed genres of music and they attracted large eclectic audiences interested in listening to everything. Whether such an audience would donate at the level an orchestra needed is a crucial consideration, I will grant you. Not to be argumentative but…there are many ballet programs which present 3 or 4 different works of contrasting style — perhaps by 3 or 4 different choregraphers –in an evening. Not everything is a full length ballet. Not to be argumentative but…you’ve got this backwards. Pops are marketed differently because they attract different audiences. I’m all for “eclectic” programs — Lord knows I’ve done my share — but I don’t believe this relates to your initial comments about musicians being confined. Now granted, this particular program is in Germany and people grow up with a different relationship to classical music than in the US. I am not suggesting it be replicated exactly. However, it is an example of how a guy partnering with Universal Music is marketing classical music to a different audience. Now will this get people into concert halls or just increase music sales and attendance at Yellow Lounge type events? Apparently classical music consumption is up in the United States. But only as recordings and not live performance so it is important not to assume an increase in one will lead to another. Perhaps the example of the Yellow Lounge provides an answer to part of my original post. The venue and expectations associated with it may contribute to the way orchestras program performances. Yellow Lounge decouples classical music from the space and attracts a different crowd. That may be one of the elements that needs to change for orchestras to realize success. But the inevitable conclusion of that is that orchestra size has to change. There is really no other suitable venue other than concert hall or outdoor amphitheater to accommodate an orchestral performance. The different venue gambit I suggested may only help classical music endure and find greater popularity. So we are back to the option of programming. Ron Spigelman notes in a comment here that has successful combined classical and pops before so perhaps his approach bears examining. As I am Principal Pops conductor of 2 orchestras this is a great topic for me! Authenticity and the “real thing” are vital, we don’t always want to impersonate (although paying tribute is fine), I have actually combined Pops and Classical before, but the real development that is needed is with the narrative of a concert, so that it is not just random eclectic stuff thrown together for the sake of looking cool and innovative. I believe in a point to a program, that way a work that may seem out of place on the surface can actually fit in the context of the point or narrative of the concert. Sometimes it is big surprise for the audience. It can work well in reverse also as I have successfully integrated Classical into Pops also. Also basing concerts on current or recent events is something that needs development. Starting with context and narrative actually is the way I like to do it. I shall elaborate more on Sticks and Drones next week, thanks for the challenge! According to the NEA study which came out last week, attendance at ALL types of performing arts is down. This means dance, theater and opera, too. The majority of survey respondents said they “participated” in the arts by going on-line at home. Yikes! We have become a society of couch potatoes. I don’t have statistics at hand but I’ll bet that attendance/participation in things like PTA, Masons, Kiwanis, Rotary Club, etc. are down, too, nationwide. I remember going to the ASOL conference in Boston – was it 2000 or 2001? – and attending a session on how to improve your orchestra web site. In those days, audio and video clips were relatively new features and they were all the rage. I stood up at the session and said to the panel: “If we make our web sites so attractive, with audio and video, we’re just giving people another excuse not to come to the concert hall.” Was I right? I’m not sure I’m understanding this. I have a small-sized oboe brain though! I read your first sentence and your second and I feel as if you just contradicted yourself. Obviously this is my problem, as I’m sure you know what you meant! But I do suspect we’ll just have to disagree on this one! This past season we played a new work by David Amram, and we played Haydn, and I can’t see that they had any similarity, aside from the fact that you have the “orchestral sound” and yes, we will have that no matter what. Even with a few non-traditional instruments thrown in you are going to have an orchestral sound. It’s what we do. We played Ellington and Beethoven and again, I hear them quite differently. Next season we are doing a work that will incorporate some traditional Chinese instruments into the orchestra. My guess is that this will create another new sound. Is the point here to get a lager audience, more butts in the seat? Maybe it’s not the music of the orchestra that’s the issue, but the business mode. on tickets sales alone. And to do that, must change their image to the general public. is not rock and roll. That in no way that music doesn’t make you want to move? really all that different than what the great violist have done in the past? I really don’t think it’s the music, it’s who you are trying to get to attend your concerts. I was referring to Pops “concerts” and Classical “concerts” as defined by the typical series differentiation used by most orchestras and how the repertoire can cross over if in a specific context, I will elaborate…next week..
PS I would be more than happy to do away with the differentiation! It’s such a long word…. As an orchestra musician who dabbles in jazz and writes about the popular music scene in Honolulu, HI, I agree whole-heartedly with Joe. I believe that time has come for symphony orchestra’s to present the greatest music of “All Times.” Holding on to the tired notion that symphonies should stick with Bach, Beethoven, and Brahms is not a viable answer to the coming extinction of the symphony orchestra that is feared by many. I am particular proud of the experiments that our Honolulu Symphony has made along these lines. A recent “Pops” offering showcased Arturo Sandoval performing both a Hayden trumpet concert and a set of his better-known jazz hits. The show was a great success both artistically and in terms of ticket sales. The symphony also regularly performs the music of Hawaiian Pop stars in orchestra arrangements of their current hits. We are fortunate to have an incredible arranger – Matt Catingub – as our “Pops Conductor” who makes creates the orchestra arrangements himself. These are immensely popular and strengthen the ties between the “classical” and “popular” performing artists in our state. Unfortunately, these “experiments” haven’t produced big financial gains for the Honolulu Symphony. I think mostly because the product hasn’t been refined to a level of great artistry yet. I think the idea, however, is definitely one for our times and one that needs to be explored further. I think you’ve asked a good question: “Why do they primarily confine themselves to a certain genre and periods of music?” But your solution (or suggestion) to incorporate more popular music strikes me as odd, and I am inclined to agree with Hugh up there, that not only does each genre covering the other come off as cheesy (and even pathetic) but that, like the Austen example he gives, they were not written for each other in the first place. Orchestras, at least to me anymore, function primarily as museums of classical music hay-day. And there’s certainly nothing wrong with that, though I do think it a shame that, unlike museums, you see very few orchestras concerned with displaying ‘modern art,’ if you will. Every culture, and every generation too, needs art that is pertinent; art that is applicable to modern life. While I find moments of rapture, agony, or any of the menagerie of emotions that make up human experience in the works of Beethoven and Brahms, it is important that modern pieces be able to do the same. It’s really awesome when a composer writes a piece that bears the influence of Jimmy Page, but if it’s just the Pittsburgh Symphony playing ‘Kashmir,’ I’ll pass. Butts In The Seats by Joe Patti is licensed under a Creative Commons Attribution-NonCommercial-NoDerivs 3.0 Unported License.